Now-a-days, carbohydrates seem to be a public enemy. However, it is important to note that the amount of carbohydrate in the diet is as equally important as the type of carbohydrate. Many people are confused about carbohydrates, because they are found in a wide array of both healthy and unhealthy foods. The healthiest sources of carbohydrates, unprocessed or minimally processed whole grains, vegetables, fruits and beans, promote good health due to the abundance of vitamins, minerals, fiber, and host of important phytonutrients. Although grains may be the most controversial carb, results of several studies suggest whole grains are very beneficial to our health. There are two types of grains: refined and whole. Refined grains have been milled, a process that removes the bran and germ. This is done to give grains a finer texture and improve their shelf life, but it removes dietary fiber, iron, and many B vitamins. Whole grains contain three parts: the bran, the germ and the endosperm. Bran and germ help keep your body healthy, your skin glowing and your hair shiny. Including whole grains as part of a healthy diet can help reduce the risk for heart disease, diabetes and some cancers. When reading food labels, look for the words “whole grain” and choose products high in fiber with fewer added sugars. Color alone is not a reliable way to pick a whole-grain product because sometimes molasses or other added ingredients give a food that nice brown color. 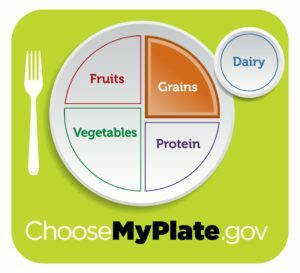 The recommended amount of grains in the Healthy U.S.-Style Eating Pattern at the 2,000-calorie level is 6 ounce-equivalents per day. Try to make at least half of a day’s grains whole grains. Learn more about our nutrition education here.